I recently spent three weeks in South East Asia, as part of an around-the-world trip which ultimately took me to Europe and Canada. This overview of Laotian broadcasting may be of interest, based on my "on-the-ground" monitoring from the area! Laos is a land-locked country, with an area of about 237,000 sq.km. It is bordered by Myanmar, Thailand, China and Vietnam, and the capital is Vientienne (Vientiane). Other major towns are Savannakhet, Pakse, and Luang Prabang. Local time in Laos is UTC + 7 hours. The main language is Lao, with four ethnic categories of Lao-Lu, Lao-Tai, Lao-Theung, and Lao-Seung, all of which are mutually understood. Laotian vocabularies is enriched by loan words from Pali, the scriptural language of Theravada Buddhism. French, English, Chinese and Vietnamese are also spoken in the principal urban centres. English transliteration uses the word Lao across a wide spectrum of understandings, meaning the language Lao, the country Lao, the people Lao, etc. The word Laotian is vanishing, but is still used by the outside world. Lao languages are part of the Thai family, centred on Thailand. Those not trained in linguistics may find serious difficulty in distinguishing Lao variants from Thai. In the Thai and Vietnamese border areas, a common dialect is widespread. I spent several days in Laos, and I was able to recognise some differences between spoken Thai and Lao. The sound we know as "a" in English is accentuated as a "sliding vowel" in both Thai, but not so extreme in Lao. The English spoken by Thai nationals is marked by the same intonations as in the parent Thai, with little variation in stress. To some people whose main language is English, the English spoken in Thailand and Laos often sounds very "flat" and guttural. Radio broadcasting in Laos is quite basic, as compared with other countries of the region. There is one national Government network, "Lao National Radio" originating from the capital Vientienne, heard on 576 kHz medium-wave, 200 kW, 2200-0330, 0400-0730 and 0930-1500. This is also carried on shortwave, using 6130, with 50 kW, intended for Laos. Content is mainly Lao variants, with Hmong other dialects. It is understood that educational programming in English and French are carried irregularly, but these were not located. In Luang Prabang, in Northern Laos, only one mediumwave station appeared to be operating in the local daytime, using 705 Khz, carrying mainly local programming, but relaying the national network from Vientienne at various times. This channel is not compatible with ITU allocations for Region 3. This operation may be intended to reduce interference effects in the secondary service area for the Vientienne high-powered transmitter using the standard allocation of 702 kHz. In Luang Prabang, only one FM station was audible in the local daytime, using 93.0, in parallel with the ME outlet on 705 kHz, with local and National network programming. Vientienne: There are two Government transmitters operating. One of these uses 50 kW, on 6130, 2200-0330, 0400-0730, 0930-1500. The intended target zone is "Laos". Programming is in parallel with the high-powered mediumwave outlet 575 and FM on 103.75. This transmitter was installed in 1994. A second transmitter of 25 kW is also used, on 7145, for what is announced as the "International Service". This is registered with the ITU from 0100-1800, with the target area designated as Laos, with programming in English, Thai, Vietnamese, French, and Khmer. This transmitter originally operated on 6130 and was moved to 41 mb when the 50 kW facility was put on line on 6130. The exact schedule was not confirmed, but the evening broadcasts were audible in the block 1130-1400 with 30 mins in each of the above languages. Other services listed are 2330-0030 (a "breakfast" service) in Vietnamese and Khmer, and a midday service 0500-0630 in French Thai and English. I believe the Lao segments to be relays of the domestic service. A third transmitter of 3 kW is listed, but unheard, on 7150, 0100-1800, also intended for "Laos". This is the transmitter which previously carried the International Service on 7112, several years ago. A forth transmitter is registered, with 1 kW, on 3315, 0100-1800, again for "Laos", but not heard recently. Outside of Vientienne, the number of regional transmitters has been reduced in recent years and now appears to number only one, but it is not known whether this is an official Government station. 4661. 1040-1230*, *1300-1400*, *2315-0030. This is listed in WRTH at Sam Neua, in Hua Phan province, near the extreme North East border with Vietnam. This is a very small town, and transmitter location is questionable. Reception in Luang Prabang was excellent, and I suggest that this station is actually located in Luang Prabang, and not as listed. WRTH lists Luang Prabang on 6971, but no activity observed on that channel at any time. 6765. A mystery station! This is a single-sideband station suppressed carrier operation, and was heard with good strength from Northern Laos during the morning and evening. I do not suggest that it is located in Laos, but there is high probability that it is! It opens with a Western style musical tuning signal, with English and Laotian announcements, announcing times and frequencies, including a message that the transmission was "This is radio..... broadcasting for Western tourists". Transmissions were heard *0930-1030*, *1200-1300*, *0000-0100*. *1330-1400*. Content was mainly in Laotian, with what appeared to be news, with national music. From a reception location in the south, in Vientienne, signal strength was much reduced. My Sangean radio does not have SSB capability, so it was quite frustrating! Care is needed when monitoring the 4 and 6 Mhz region for the South Asian regionals. 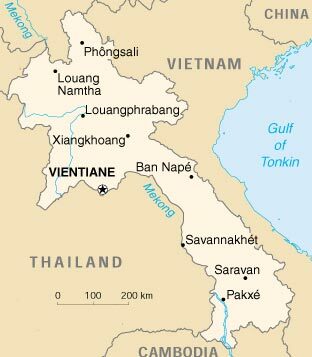 From thousands of km away, Lao can sound very similar to Vietnamese! Broadcasting in Laos is very modest, with all broadcasting operations servicing local and regional communities, for MF, HF, and VHF. Lao National Radio is a full member of the Asia-Pacific Broadcasting Union, and HF transmissions are coordinated with other members of the Union, reporting to the ITU in Berne.